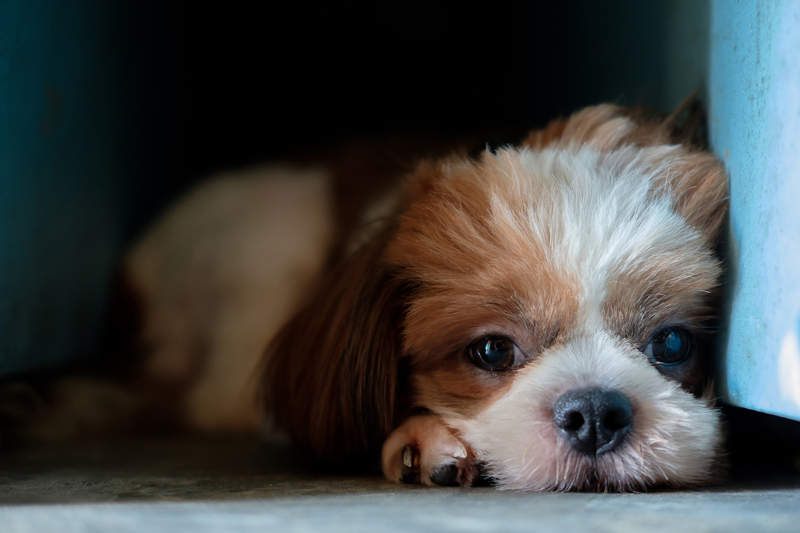 Dogs Make Me Feel Vulnerable And Guilty… Why I Have One Anyway. Dogs have been a part of my life since I was a little girl. It’s not that I’m particularly fond of them or anything; it’s just that I grew up on a farm and dogs were something of a necessity. There was that one dog, though… the first one. We named him Pupik because it’s slang for belly button in Hebrew and he was both as cute as a button and as small as a navel. I have a memory of the moment my parents gave him to me. It’s one of those fuzzy how-much-is-this-my-memory-how-much-is-it-family-history kind of images. Either way, it’s become part of my soul story. It goes something like this: I’m 3 or 4 and I’ve fallen asleep in the car after crying over some childish disappointment. I awake to my fingers resting in a pile of fluff, a sweet smell of grassy fur, and a tiny wet nose sniffing my ear. I snuggle this cooing, squirmy ball of fuzz against my neck and wonder if it’s my favorite teddy bear, magically come to life. In between the beginning and the end of Pupik there were lots of vague memories of laughter and shrieks as he chased me around the house, tugging at my socks, his yips sounding like something between a hiccup and a giggle. And then there’s the last memory. This memory is sharp, focused, too jagged to be part of the generally happy blur of my youth. It goes like this: I’m 8 years old standing outside of the house with my younger brother. My parents have taken in a homeless family for the night (as they often did). They have a dog with them. A large dog. A terrifying dog. My parents insist they keep the dog in the car until they can find a more suitable place to put him. But the dog is restless and probably hot and the teenage boy can’t bear to see him pent up and opens the door. And then… the dog rushes towards Pupik, not barking, only growling, a low ominous growl that seems to rise up from the Earth itself. He grabs Pupik in his teeth and just shakes and shakes and shakes. It gets fuzzy again after this point. I remember screaming. But I’m never sure if it was me or my brother… or maybe both of us. I remember thinking I should do something, I NEEDED to do something. And then, when I saw him there, twitching on the ground, long past saving, I knew there were no more things I could do. Afterwards came the guilt. A heavy swirling, sick-in-my-stomach feeling of guilt that never really left me after that. Looking back, of course I did the right thing. I mean, I was a kid, right? The thought of my own 8-year-old daughter rushing at some mad vicious dog is terrifying, ludicrous, illogical. But, emotions don’t obey the laws of logic and that guilty feeling around dogs remained with me. So, when my parents got another warm bundle of puppy fluff to console me, I never bent down to pet him, never ran around the house letting him tug at my socks, never gave him special treats. In fact, I pretty much ignored him. And ignoring him only made me feel more guilty. My reflection in his big sad eyes was always disappointing, never brave or loving enough. Eventually my parents gave him away to a more attentive family. But, they got other dogs. Dogs that mostly stayed outside, that didn’t pay me much attention, that didn’t ask anything of me. Dogs that eventually died or ran away or sort of faded out of my memory. It was better that way. What was the point of loving something that you KNEW was going to die, that you KNEW you would constantly let down, that you KNEW was just this ticking time bomb of sadness and disappointment? When I moved out of the house, I vowed to never own a dog. There were plenty of places in life where I could be reminded of my inadequacies and vulnerabilities without inviting them into my home in canine form. But then kids, and the suburbs, and a son who insisted that owning a dog would be the key to getting him off of electronics and out in the backyard, Norman Rockwell style. We adopted a 4-year old rescue dog. She had white fur and brown spots and big eyes that saw right down to my soul and said “You’re gonna screw this up!” (gently of course) My daughter named her Sunny for her sweet disposition and bright expression. Despite his promises, my son’s interest in the dog was fleeting. And, soon, she was wandering around the house, her brown eyes pools of loneliness and passive aggressive accusation. I fed her and watered her and made sure to let her out frequently enough. But, otherwise, I ignored her. Sadly, so too did the rest of my household. In a world of pop-zip-sparkle apps and laughs-a-minute Youtube shows, a middle aged dog just wasn’t that entertaining. And then, my father-in-law got into a tragic accident. Suddenly the apps and Youtube shows were too loud, too insensitive. They provided jerky, intrusive tickles when what we really needed were warm, soft hugs. Turns out that’s what our dog excelled at. For the months after my father-in-law’s accident, my daughter spent most of her waking hours cuddled against Sunny. She’d bury her face into Sunny’s fur and whisper all her of her secret worries into her ear. I’d watch her and worry… About if my father-in-law would recuperate fully, about if my daughter was handling her emotions OK, and about what would happen when Sunny’s much-shorter-than-human lifespan ran out, leaving my daughter heartbroken, as I was after Pupik’s death. In the end, it was my father-in-law whose time with us came to an end. Three months after his accident, he succumbed to his injuries and passed away, devastating all of us. After the initial tears and grief, anxiety began to work its way into our home. For all of us… but especially for my daughter. TV shows that were funny now terrified her, school, that she used to enjoy, now stressed her out, and Sunny, who used to comfort her, now worried her. My daughter had learned (too early) that life was fragile. Instead of a source of enjoyment, Sunny had become a constant worry. And.. of course, her worries became my worries. What was I thinking adopting a dog? Hadn’t I already learned how they could break your heart? Make you feel guilty? Make you vulnerable? Then one day, my daughter came home in tears because she didn’t do well on a math test. She gave me a quick hug and flung herself onto the couch where Sunny was waiting to enfold her in cuddles and slobbery kisses. I felt so heartbroken to see my daughter falling apart like that. So guilty for not helping her study more. So insecure about my capability to teach her math. Yet, despite all that, seeing her sweet face buried into Sunny’s fur, my daughter’s long auburn hair looping down over Sunny’s sympathetic eyes, there was no doubt in my mind that it was all worth it, that my daughter is worth it. And perhaps, so too is Sunny. Lela Casey is the assistant editor at The Wisdom Daily. Her writing has been featured in many websites including kveller.com, brainchildmag.com, and femininecollective.com. She is a seeker of wisdom, adventure, and kindred spirits.